According to the reckonings of Treasury managers and economists, the rupee could slide back to its 43 levels against the US dollar by the end of this calendar year; the short term gains of the local currency indicated at a weaker currency over the medium term. The growing rupee signals losses for exporters who earn revenues denominated in other currencies; it could broaden the trade deficit by the year end. The rupee has risen by almost 150 paise within a month’s time. 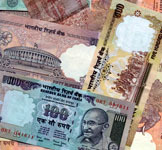 On Tuesday, the rupee further surged from Monday’s levels, rising to 41.64 levels during the day. However, it ended the day at 41.97. The Tuesday’s correction is viewed as an outcome of investors settling short-dollar positions on fears that the central bank would intervene heavily to stem the rupee’s rally. The rupee has been up 12% from a three-year low of 47.04 in July, including more than 6% in 2007, to be Asia’s strongest currency against the dollar this year. The rupee would depreciate to around 43 levels against the dollar by the end of this calendar year, says the forecast of Standard Chartered Bank and ABN Amro. “The rupee will remain extremely volatile over the next few weeks. The Reserve Bank of India’s absence from the forex market is helping the local currency gain some direction. But, by December 2007, it is likely to weaken to 43 levels,” said Sundeep Bhandari, regional head-global markets, South Asia, Standard Chartered Bank. According to YES Bank’s president, financial markets and institutions, Ajay Mahajan, the rupee and the Chinese yuan are expected to outperform within Asia, while others such as the Singapore dollar, the Taiwan dollar and the Korean won may not be doing so as they are not dealing with the issue of large forex inflows.